You all know by now how much I adore the Hokkaido Milk Toast recipe which I've made many times before. This time around I wanted to combine both of my two favourite things: Hokkaido milk toast + green tea, so I incorporated matcha and boy, the result was AMAZING!! The kitchen smelt so so good when I took the bread fresh out of the oven. The bread not only smelt great, its texture was also to-die-for. It was soft, milky and fluffy!! I was so so happy, I cut myself a thick slice, and enjoyed it plain on its own, with a cuppa homemade green tea latte, whilst beaming from ear to ear. Bread-making to me, is very satisfying. Sure it is arduous, and yes there are a lot of steps and waiting period, but I can assure you it is all worthwhile in the end. I am crediting the great texture of the bread to the use of tangzhong (water roux) method. 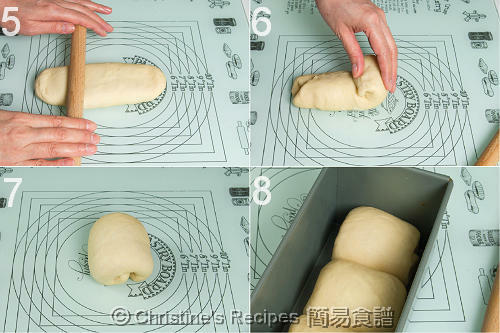 I've used the tangzhong method numerous times and it always, always yields a good loaf of bread. In terms of the matcha strength, it could definitely be a little more distinctive. I used 15 grams of matcha powder and loved that there was a delicate, but not overly subtle green tea flavour. However, as I like my matcha strong, I will try 20 grams of matcha powder next time. Kindly also note that the original recipe calls for bread flour, but as I ran out of bread flour, I improvised and used Lillian's recipe where she has substituted bread for plain flour instead. To my surprise though, I did find the bread this round using plain flour to be a little softer than usual. I guess I won't bother going out of my way to get bread flour next time. Add all ingredients (except butter) into a breadmaker, first the wet ingredients (egg, milk, tangzhong), then followed by the dry ingredients (flour, sugar, salt, matcha powder, yeast). Select the "dough" mode (refer to the menu of your breadmaker to select the kneading dough programme). When all ingredients come together, add in the butter, continue kneading until the dough is smooth and elastic. The time of kneading in the breadmaker is about 30 minutes. Let the dough complete the 1st round of proofing, about 40 minutes, best temperature for proofing is 28C, humidity 75%, until double in size. Punch and deflate dough, then remove dough from bowl and shape into a ball. As this recipe makes two loafs, divide into six equal portion. Knead into balls and let rest for 15 minutes at room temperature. 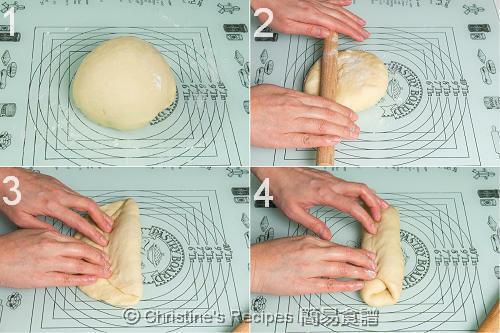 Roll out each portion of the dough with a rolling pin into an oval shape (see picture 2 below). Fold 1/3 from top edge to the middle and press (see pict 3). Then fold 1/3 from bottom to the middle and press (see pict 4). Turn seal downward. Roll flat and stretch in length (see picture 5). With seal upward, roll into a cylinder (see picture 6). With seal facing down (see picture 7), place in the loaf tins to have the 2nd round of proofing (see picture 8), until double in size. The best temperature for 2nd round proofing is 38C, humidity 85%. Brush whisked egg wash on surface. Bake in a pre-heated oven at 180 degrees C for 30 to 35 minutes, until top of bread is shiny and golden brown. Mix flour in water well without any lumps. Cook over medium-low heat, stirring consistently to prevent burning and sticking while you cook along the way. The mixture becomes thicker and thicker. Once you notice some “lines” appear in the mixture for every stir you make with the spoon. It’s done. You get the tangzhong. Transfer into a clean bowl. Cover with a cling wrap sticking onto the surface of tangzhong to prevent from drying up. Let cool (I always let it chill in the refrigerator). The tangzhong can be used straight away once it cools down to room temperature. Just measure out the amount you need. The leftover tangzhong can be stored in fridge up to a few days as long as it doesn't turn grey. If so, you need to discard. Note: The chilled tangzhong should return to room temperature before adding into other ingredients. There's so much you can do with this Hokkaido Milk toast recipe! I made a milk and chocolate version as well, just by substituting the matcha with either milk powder or cocoa powder. The flavours went really well together, and the bread were as usual soft and fluffy. If you love soft bread, and enjoy bread making, I definitely recommend you give this recipe a go. hi, love your blog! May i know how you roll the dough to mix 2 flavour? Awww thank you. Flatten and roll out both dough, then place one on top of the other. Then roll them up like you would a swiss roll. Hope that helps! Hi, i just tried making this bread but my dough came out sticky and i think too wet to roll into any bread dough. Could you share if your dough was like that? Mine is completely different from the pictures. :( so sad. Oh my softer bread with the All Purpose flour? Mine is ultra soft with the bread flour but now I'm going to try it with regular flour! I tried Christine's recipe with pumpkin and the dough was too wet. I wonder if it'll be better with APF! Hi Thea, sorry to hear the recipe did not work for you. My roll was not sticky, but in the future if you experience this again, try adding 1 tbsp of flour, and knead again. Don't add too much flour in the one go, try 1 tbsp at a time. As all flours are different (brands, where it is made from, etc), some flour can be a little wetter than others. I hope this doesn't discourage you from trying the recipe again. If you want to send me an email at thebakeanista@gmail.com, I can send you a picture of how the dough should look. Hi there MyThy, I too was very surprised. I have always been using bread flour and the results were always good - soft and fluffy bread. However I did find using APF, the texture was slightly softer. I no longer go out of my way to get bread flour now, as there is unfortunately only one brand available in the supermarkets here in Melbourne. Hi dear, I don't have bread machine I use the dough hook to knead. .may I know the steps is it the same? Knead 30 mins? And can I half the ingredients if I just wanna make 1 loaf? Hi Jess, I've personally never tried using the dough hook on stand mixer to knead. But I would suggest about 30 minutes. Make sure to do the windowpane test. It will tell you if you've kneaded the bread dough enough. Hi !May i know do I need to reduce the milk if i add the tangzhong into the ingrident? Hi if you're following my recipe exactly as it is, then you don't have to reduce the milk. But if you're looking to alter the recipe with more tangzhong I'd highly recommend not to do so. Good luck! Hi if i want to make 3 flavours does that mean i need to do the dough in 3 separate batches and 1/3 the recipe? Or can i add cocoa powder and matcha powder once the dough is ready? Hi anonymous, I actually made three different batches separately as I made more to give away to friends and family. I personally haven't tried adding cocoa or matcha powder after the dough is ready so I can't be too sure about that. This is just my suggestion which I have not tried myself, but perhaps after kneading the dough, before letting it rest and proof, that would probably be most ideal time to separate them into 1/3 each and add cocoa and matcha powder separately. I would suggest kneading them for a little longer to mix well then let them all rest and proof. Hello, I wanted to confirm that 20g of matcha = about 10 teaspoons? It looked like a lot of matcha so I just wanted to make sure! Hiii i had that exact same question and i did that like i only added cocoa and matcha after kneading & before proofing. Turned out super! Wish I could attach photos of my bread! Thanks!! Dear Yan, sorry for the delay in replying. I actually weighed the matcha instead of using tsp or tbsp as measurement. Don't quote me on this but from memory it was approx 2-3 tbsp. I would suggest actually weighing to be more accurate. I know right, blogger should upgrade and do what FB does, allowing photos and video attachments to comments. Is a breadmaker required for this? I have a mixer and it has a dough hook, but I have no breadmaker! Dear Yii-Huei, I have only tried making this dough in the breadmaker but not with the mixer. I believe it would also work, but may require a bit more kneading time. The dough may also be slightly sticky at the start with the cake mixer and dough hook, but I am guessing it would work. Hello can I make this as a loaf in the bread machine instead of buns? Hi which butter did you use - unsalted ones? And if i could make this as a loaf in the machine instead? Thanks! Hi Jaynarti, I use unsalted butter usually. I've never tried making this as a loaf in the machine before so I can't say for sure if it will produce the same fluffy result. Hi! Just came across your blog when I was searching for matcha bread recipe. I am still new in bread making so it is my first time learning about tangzhong! Since you mentioned that tangzhong gives great texture to the bread, may I ask if tangzhong can be used in any recipe and if yes, how or what should I substitute it with? 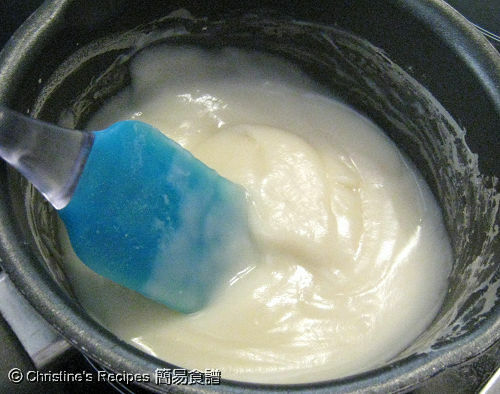 I've never come across a recipe which requires tangzhong but I would definitely like to try if it produces a better texture! Also, as I usually make my bread using a bread machine, is it still applicable to use tangzhong? Great recipe. I made the matcha bread this morning. I melted some white chocolate and spread over the toast for my teen daughter. She loves it. I will try the three flavor rolls next time. Thanks for sharing. Hi there, yes tangzhong can be used even in bread machine but how exactly to substitute it with other ingredients or include into certain recipes I can’t be too sure as I usually work on modifying recipes that already include tangzhong. This is one excellent, must-repeat recipe. Made it this afternoon. It's 101% yummy!! Thanks a ton!